Natalie Henderson has always loved football. "From the moment I could walk, my father made me kick a ball," she says. "When I was 16 I did my level one coaching certificate. "I wanted to be a PE teacher but once I started coaching everything fell into place – I started doing it more and more. And I knew that’s what I wanted to do full-time for the rest of my life." She became a part-time community coach at her hometown club of Newcastle United at 20. "I never imagined working in the men's game, with the boys," she says. She was spotted by Joe Joyce, Newcastle's academy manager, who encouraged her to enrol on the Premier League’s Elite Coach Apprenticeship Scheme (ECAS). ECAS introduced Natalie to other coaches with whom she could share insight. It also opened her eyes to a world outside football. She experienced voice coaching at The Royal Shakespeare Company (RSC), a placement at fashion house Ted Baker, life at Spanish football clubs Villarreal and Valencia, and watching Olympic diver Tom Daley train. "You experience different environments, but there’s a lot of crossover you can take back to your club," she says. "At the RSC we learned about body language, tone of voice, how to engage people. It’s the same with young players, we want to engage them. 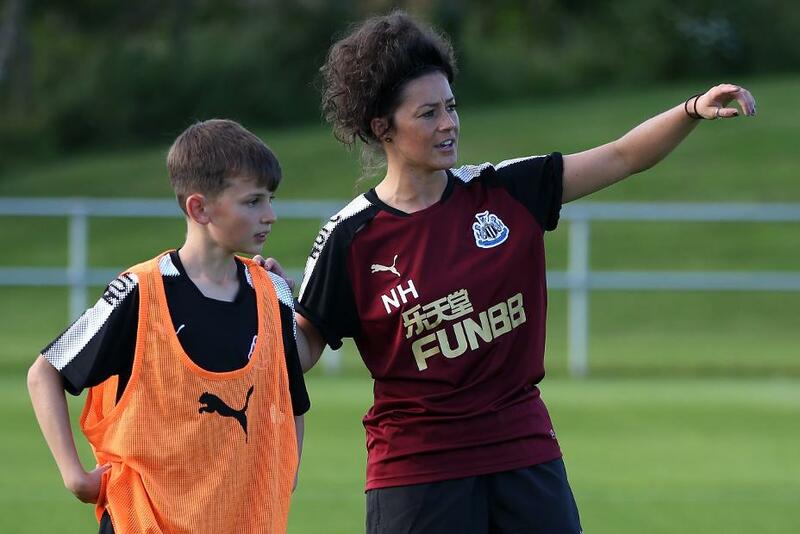 Having graduated from ECAS, Natalie is now the Under-12s coach at Newcastle. It took some people outside the club getting used to having a woman among the coaching staff. "When I compare when I first went in to now, I've noticed a big change," she says. "There’s not as many people who look as shocked as they did three years ago." She is one of two females who are coaches at Premier League academies, and the plan is for many more to come through, as part of the League's aims to make the coaching landscape more reflective of our diverse society. For three years, the Premier League's Black and Minority Ethnic (BAME) and Female Coach initiative has been providing opportunities and funding for coaches from these areas to enrol in ECAS. "The biggest message for me is it doesn’t matter if you’re male or female, black or white, if you’re a good coach, you’re a good coach, and that’s how I hope other people see it that way as well," Natalie says. "Everybody has their own qualities and everybody has their own experiences to pass on to the players, and I think that’s really important, to have a diverse set of staff to help that." The openness to new ideas and experiences was on view at last week’s Premier League Youth Development Conference. Coaches from all 92 clubs in the Premier League and EFL shared their insights over two days at Wolverhampton Wanderers and West Bromwich Albion. Natalie was there to provide her knowledge and learn from her peers. "For us to make the best players in England we have to have the best coaches in England," she says. "It's more about developing the best players in England rather than just our clubs, so I love the idea of us all coming together, sharing ideas, sharing best practice, because we’re all after the same thing."